Hamilton is located 3.5 hours’ drive from Melbourne and 5 hours from Adelaide in the "Green Triangle" of Western Victoria. There are signs from the main highway indicating the direction to the hospital. A local bus service runs in Hamilton. There is a bus stop located at the front of the Hamilton Medical Group, adjacent to the main hospital entrance in Foster Street. A taxi service is run locally by Taxis of Hamilton. You can contact them on tel: 03 5571 1200. There is a patient drop off point on Foster Street. It is undercover and provides direct access to the Hospital. There is another drop off point at the front entrance of the Hamilton House Allied Health Centre. 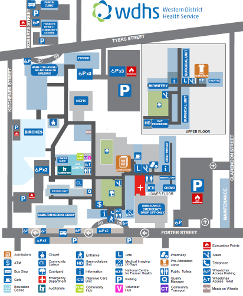 Car parking is available next to the main hospital building in Foster Street and also off Tyers Street. A two hour parking zone runs along the front of the hospital on Foster Street. Disabled parking is available at the front entrance of the hospital, at the rear of the building adjacent to physiotherapy at the Education Centre entry off Kitchener Street and at the Frances Hewett Community Centre.